Heat oil in a fry pan, add spices to it and allow to splutter. Add chopped onion pieces, fry till it turns pale pink in colour. 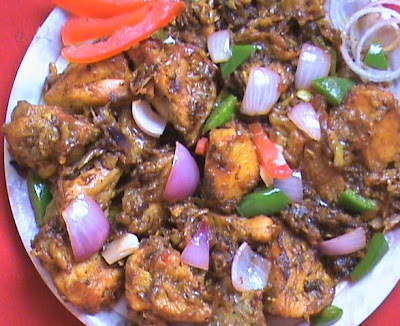 To this add washed chicken pieces, fry in medium flame for about 5 mins. Add curry leaves, garam masala pwd, red chilly pwd, cumin pwd, salt, turmeric pwd and toss for another 5 mins. Add 2 tbsp curd and combine well. Finally add chopped tomatoes and allow to cook. Add pepper pwd and sauté it for 2 mins. Add 1 tb water and boil chicken with masala covered for 5 mins. Once the chicken is fully cooked, simmer the flame. Allow the gravy to thicken for desired consistency. 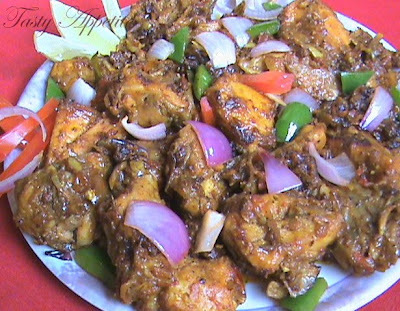 Slice onion, capsicum to small triangular shape and fry them to golden, in a separate pan. 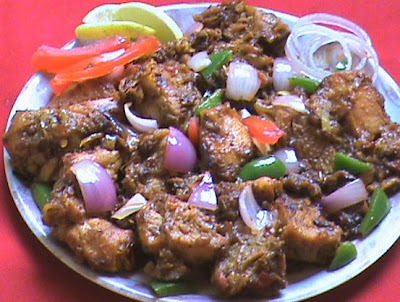 Garnish Chicken Varutha Curry with fried onion, capsicum, freshly chopped coriander sprinklings.